"Frameworks in the New African Security Context"
It is said that every decade or so our world creates a new global order – as generations shift, leaders transform, visions change, and creativity and innovation force us all to live our lives better, longer, differently and certainly with more challenges. Today, more than ever, we need to address security challenges, abject poverty and the lack of development -- protecting in the course of these efforts, basic civil and human rights. So today I want you to think like a leader in the 21st Century – think about both the challenges around the world, and development issues – both in my view are strategic issues -- needing more innovative thought, better strategic communications, and more partnerships as we move forward in the 21st Century. This is a tall order, therefore since I am primarily before a Nigerian audience today, let's narrows this down to the practical – looking at both Africa and Nigeria. Africa's security and development landscape is much, much different than it was 10 years ago, 5 years ago, or even last year, and so is Nigeria's. I consider both these key components -- security and economic development -- fluid, needing our evermore robust, innovative efforts, action, and creative thinking. So what are the imperatives? How and what does one focus on to have strong economic development in these challenging, fluid and sometimes very difficult times? African countries from Nigeria-to-Kenya-Tunisa-Libya-to-Mozambique, or better said from -- Maiduguri-to-Mombasa-Midoun (Tunisia)-Misrata (Libya)-to-Maputo -- and in between, are all grappling with these core pillars of today's policy challenges. The foundation we all recognize is good governance and addressing the needs and concerns of the people in a society, in a community. When neither of those is met, they set in motion, in many respects (not all), the security challenges we see today. Let's take factors affecting security first and what might be driving the challenges we see today and then apply these to Nigeria and the Continent. What do I mean by demographics – as my definition of demographics is an expansive on. I mean, everything that impacts outcomes and geo-political relationships – from economic disparity to population sizes and breakdowns by age and gender; world resource locations (where is the oil, timber, jobs, lack of jobs, etc., where are land and water resources; what role religious differences or groups might impact community or world views, or affect perceptions. In essence, what are the human, community, or country cultural differences of which you need to be aware which might be impacting security today. Let's look at some examples of broad demographic categories and then drill down from there. -- What regions of the world have the most arable land and available water resources? Answer: Africa and Latin America. -- Where is the most economic income disparity today (despite our own economic challenges in the US)? They are in Africa, Latin America, and Asia, with South Africa leading the way as the country with the world’s greatest inequitable income distribution. -- What regions of the world have the largest growing youth and gender demographics? Africa, tops the list (in fact it is called the youth bulge on the Continent as you know), followed by Latin America, the Middle East, and parts of Asia (with Japan being an exception with an aging population, and China having both a large young and old population). -- On women, if the numbers of women in the world made up a single nation, that nation would be the third largest in the world behind China, and India.xii The Nigerian female/girl population is about 74 million. -- Poverty, food security, corruption, lack of good governance, lack education and employment opportunities are also top of the list for Africa, Latin America, the Middle East, and Asia. What are the demographic figures in your country, in your community? If you don't know them you should, you need to in order to effect change as a 21st Century leader, or organization focused on well-being and giving back. -- 43 percent of the world’s population lives on less than $2.50 per day, and in most of Africa it is less than $1.00 a day. In Nigeria it is $1.25 (about naira 290). Keeping in mind this means – in search of $1.25, not a guaranteed $1.25 per day. Sixty percent of your population face this every single day. -- By 2020 1 million more people in the world will be pushed into poverty on top of the current 3 billion (source: CCTV 2014, Terryane Chabet report)i; globally 22,000 children die each day due to poverty; 1.1 billion children in the developing world don’t have access to clean water; and 75 per cent of the world’s wealth is in the hands of 20% of the world’s population. If I am saying that demographics are strategic issues – and that is what I am saying -- then what are the specifics for Nigeria? What are the demographic issues that you need to be focused on that are and can further feed into the security, development and economic challenges your nation faces today? Here are a few to put things into perspective. -- Let's start with your population of roughly 172 million people – the 7th largest in the world - being both a positive and a challenge for the nation. It is a demographic which is both fluid and requires innovative thinking to meet the economic, social and quality of life needs. -- Unemployed youth & the youth bulge (10-35 years, will represent the bulk of your population over the next 5 decades) are next on the list. Do you know what this exact figure is for Nigeria in terms of numbers? -- Currently it is estimated that you have 74+million young people in this particular demographic and growing. These are young people in search of their future with no current prospects. -- Economic inequality follows. Even for those who find "underemployment opportunities," in general, the income inequality is great, not just in Nigeria, but as noted above South Africa holds the world's high stat on this issue. To further highlight in the global context, according to Farid Zakaria CNN-GPS 2014 broadcast, 18 people in the world have as much money collectively as 3.5 billion folks. Think about that! So income inequality is another strategic demographic category to which you as a 21st Century leader/organization will need to pay attention. -- Where does Nigeria fall on the gap between rich and poor – 44 out of 86 rated -- actually one notch above the U.S. -- on easier understood Palma Ratio which measures this and has a slightly difference focus than the Gini coefficient which heavily weights middle come in its ratios. -- Nigeria has the highest rate in the world of school age children out of school at 10 million. A key stat given that 44 percent of your population is also 15 years old or younger, and 39 percent of adults cannot read or write. Thus, these are both economic issues and security issues rolled into one supra-paradigm for the country. So the questions for this lecture are what to do, what does Africa do; what does Nigeria do? These are the imperatives that have to be addressed in order to counterbalance the escalating challenges caused by groups (e.g. Boko Haram, Al Shabaab, ISIL) which counter world goals using tools of extremism and terrorism to achieve them. First let me say you are off to a good renewal. For Nigeria, you have begun your initial move into a new "league of democratic nations," with the success of your March elections and the peaceful transition of power in May, as good governance, as I noted earlier, is the baseline from which to build and move forward. 5.) Making his first foreign visit, after being inaugurated, to Niamey; and, also thanking Niger, Chad, and Cameroon in his inaugural speech. He also made education, agriculture/food security, improving energy and health systems, and assisting IDP's as top priority development issues with fighting corruption being "pivotal-center" of his Administration. So there seems to be a chance now to contain Boko Haram. However, I also think that it is important to remember that Boko Haram is just as committed to its objectives and goals, and success might have to be measure in terms of containment and sustainability of recaptured territory. -- New economic development sectors such as information systems and technology, continued growth of SMEs, and trading have all helped spur Nigeria to where it is today. What to Do? What Can You Do? -- Be creative on education (include vocational and entrepreneurial, and help train and expand the number of SMEs and MMEs (companies with less than 5 people). The majority of the above points are not just Nigeria's challenges but also for the Continent. Indeed, everything that impacts people’s lives and their social, political, and economic well-being, are for me, strategic-demographics-development issues for Africa’s and its burgeoning population. These issues are even more important today as they are affecting those in their prime education, prime wage earning years (18-40yrs), and Africa’s youth bulge (10-35yrs) -- or nearly 600 million young people on the Continent. -- 3 per cent – number of African adults with credit cards; only a quarter of young African adults have accounts at formal financial institutions -- meaning the majority of Africans are still not connected in any way to the global formal financial system. This being said, again all the news isn't bad for the Continent either, just like it is not all bad news for Nigeria. -- 18 countries have GDP’s of 5 per cent or higher. I have pointed out both the challenges and the positives because, as the global landscape continues to change rapidly, we need to ensure that the next generation of young Africans, young Nigerians sees, feels, and believes there are opportunities for themselves and their families. My Message for Today -- Lean Forward! Remember to Lean Forward! As a Diaspora Group and take a look at the possibilities of what you can do as an organization, as an individual. There are a number of economic development areas I noted above where you can help turn the tide. 2.) Think about philanthropic contributions. Although improving, Africans fall behind in this area more than many other world regions. 3.) Think about the strategic long term to changes these development demographics, improve them -- or in the case of population – help to build societies, communities where young people, young Africans feel: embraced, enfranchised, and most importantly empowered. [xv] 6/2015 Human Rights Watch Annual Global Summit, Chicago, Drake Hotel, panel "World Migrant Issues." May 29, 2015 – date of the power shift, paradigm shift, political shift marking the New Democratic Dispensation for Nigeria and its people. May 29, 2015 ushered in in a New Nigerian President – General Muhammadu Buhari -- who gracefully, but emphatically laid out his change-agent strategies for Africa’s most populous country. 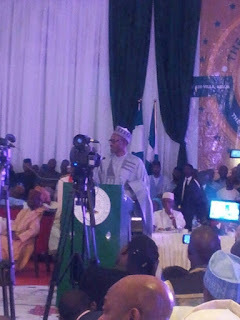 As he spoke before an enthusiastic inaugural crowd at Abuja’s Eagle Square, it was clear that he was further outlining things he had previewed, in what FEEEDS® is calling “The Buhari Doctrine.” His speech was a mission statement, road map of where he wants the country to go, how to get there, and the fortitude required of the nation to make real, sustainable change happen. -- Post-election political animosity needs to be set aside so the country can move forward. The inaugural crowd called Buhari “Baba” (meaning Father-Leader) as they reveled in the 4-hour historic moment -- setting aside momentarily worries about one of the worse fuel shortages Nigeria has ever seen. Sensing the need to manage mission with implementation, Baba Buhari added the watch words "patience and time" to his inaugural speech to manage expectations from his countrymen and the international community as he will need lots of both to fix, correct, and improve challenges outlined above. It seems President Buhari’s had truly taken on the father figure of the nation as his message was part counsel, vision, and a preview of his leadership style. There is a Nigeria he envisions, one that functions better economically, politically; where Nigerians honor each other; which has a vibrant civil service; and where there is discipline. Yes, he was a military ruler; yes, he came to power in a coup (1983-1985); and yes he was removed by a coup. This does not diminish his inaugural message, his 12-year doggedness to become president, and his mission to be true to Nigerian voters. He wants a mature democracy that includes action against corruption, impunity; and a democratic philosophy for Nigeria’s future built on transparency. Nigeria has already turned a page, deepening its democracy with the 2015 election, and May 29, 2015 transition. One interesting take-away of the inaugural activities was they reflected the diversity of Nigeria. They were inclusive: regionally, ethnically, religiously, and surprisingly, to some extent politically. In attendance, were a fair number of previous ruling party (PDP) stalwarts, Muslim and Christian leaders, activists, academics, media, and captains of industry. It was one of the most inclusive events Nigeria has had in a while – an important early achievement of Buhari’s victory. Yes, sour grapes do remain within PDP, but some (not all) dusted themselves off following post-election shock, and behaved as conciliatory as former president Jonathan. It would be hard for any fair-minded person not to support the notion of every Nigerian having the opportunity not to live in poverty or fear, providing there is no intent on harm, human rights violations, or abuse. Democracies are not about one voice, but "inclusiveness" (all political and religious views, ethnic groups, women, youth, disabled, civil society), albeit fairly, constructively, transparently, and without malice. · Focus on women and at-risk girls from education to financial inclusion as they lag on all human index well-being indicators. Changing any of the above will improve the life of the average Nigerian. The peaceful transition is just the start and we need, as the international community, to do all we can to support President Buhari and Vice-President Osinbajo to implement their positive mission for the nation.